The classic Birkenstock gets a fantasy/nightmare makeover thanks to Opening Ceremony. I’m gonna be honest here, I tried on those furry Birkenstock sandals last year and very seriously considered buying them. They’re incredibly comfortable, albeit completely impractical. 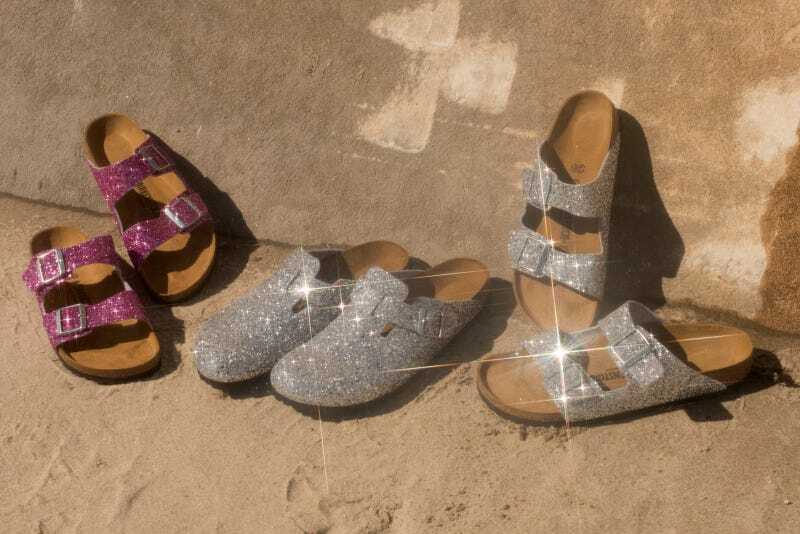 Now, Birkenstock is teaming up with Opening Ceremony to create a slightly more wearable, but still über-trendy sandal, by slapping a whole bunch of glitter on it. The disco ball Arizona sandals debuted on the runway at Opening Ceremony’s most recent fashion show that took place at, where else, freakin’ Disneyland. The sandal will retail for about double the price of an unadorned Arizona, but will boast a hefty amount of glitter, in either pink or silver. It’s exclusive to Opening Ceremony (so don’t expect to see a sale on these on Amazon any time soon) and promises to blind bystanders and commuters alike whenever the summer sun hits your feet. The Birkenstock Boston slip-on clog will soon follow suit as well, in the same glittery silver shade. Thankfully, both styles feature Birkenstock’s iconic contoured footbed and a soft, fleece lining so you don’t end up tearing your feet to shreds on all that glitter. It’s not often that glitter is used so aggressively in shoe design, but do you expect anything else from Opening Ceremony? To be worn with or without socks (please, wear them without), the Birkenstock x Opening Ceremony sandals are truly a sign of the times to come, where we’re all just taking an ugly shoe, making it into a fashion statement, and then having a unicorn throw up on it.